Together with our customer – V-ticket, we tried to create something special that would give the opportunity not just to buy a ticket for an event, but also to find interesting events according to your preferences. And fortunately, we managed to do it The result is called Concert.ua. So, the main idea was to create a resource with interactive trend design, where one would be able to find an interesting concert and buy the tickets quickly. All the events are sorted by genre, location, time and etc to create comfortable advantages for users. To achieve our goal, we engaged a team of qualified PHP- and HTML-specialists and designers from our [bvblogic] company and applied modern effective technologies to solve all the tasks. When implementing online ticket sales our developers faced the difficulties with integration and customization of the resource with dozens of outer resources. Very important was the security system of payment transaction for the ordered tickets. As the resource is aimed at ticket sales increase, we set the goal to get exact statistics and reporting system about order amounts to control and develop the loyalty program. We managed to accomplish all of the goals effectively, thanks to the high qualification and large experience of our guys from [bvblogic], thanks to their focused creative work. So, our solution has dozens of integrations with outer services and also it’s own statistics system that helps to track all the business processes. 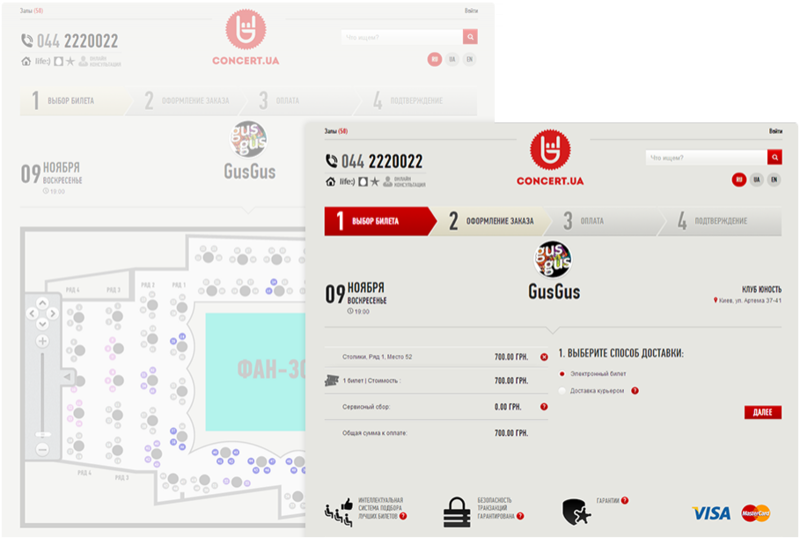 The service provides our users with the benefits – both for the buyers of tickets and for the event organizers, as well as for the owners and administrators of the service concert.ua. While using the resource, the visitors can enjoy the latest achievements in web design sphere. The system offers one of the most comfortable ways of choosing tickets for different events on the Internet. The maintenance account helps to automate the process of events placing and simplifies control of sales. Thousands of users daily buy tickets using the web-service. 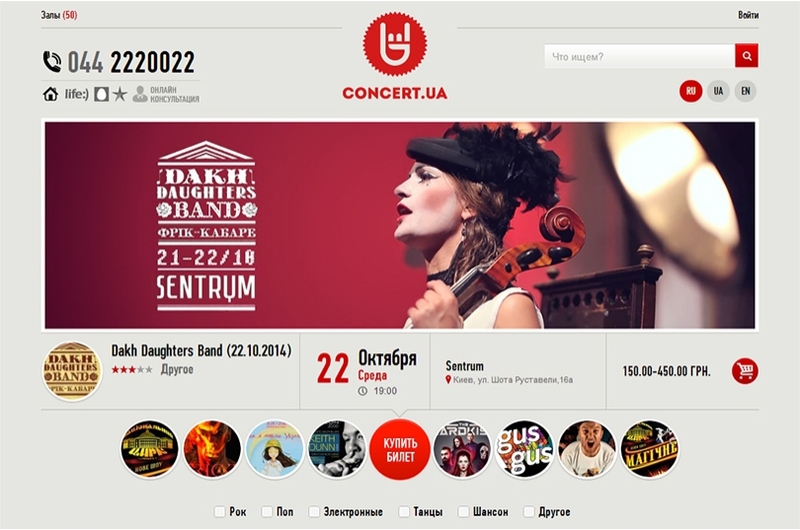 This year, the Ukrainian national premium nominated concert.ua for the title of the best online service for buying tickets in Ukraine. The user recognition is the thing that really motivates us to work and create more and more interesting projects together with our customers. Did you like this solution? We are ready to implement all interesting ideas in life, and yours too! Let’s create great things together!